I’ve become a huge fan of vanilla recently, using it in homemade vanilla bean ice cream, homemade vanilla bean coffee creamer and even using vanilla extract in homemade bug spray. For several years I’ve bought vanilla extract in bulk, buying what I thought was a quality product for a fair price. Then we moved to Georgia and the price for vanilla extract doubled. That was my cue to start making my own homemade vanilla extract! Despite the fact that we typically use vanilla extract only a teaspoon at a time, health-wise, it concerns me that these unnecessary and potentially harmful additives and sweeteners are legally allowed to be in store-bought vanilla extract. Especially when you’d think that “vanilla extract” only contained vanilla. Have you ever looked to see what’s in your vanilla? I’ve found dextrose in Kirkland brand vanilla extract (from Costco) and corn syrup in McCormick brand – and I bought both of these bottles without even thinking to read the label before hand. From a budget perspective, it concerns me that “pure vanilla extract” can be significantly watered down! The manufacturers can dilute their vanilla extract appropriately and while we think we’re getting 100% vanilla extract, we’re really get 35% vanilla extract! 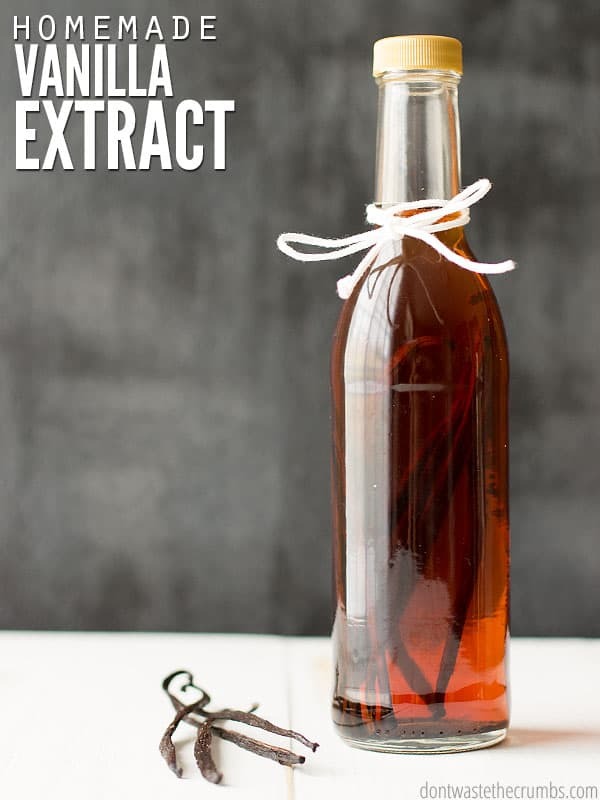 Is Making Your Own Homemade Vanilla Extract Really Cheaper? I mentioned earlier that after we moved to Georgia, the price of vanilla extract doubled. When I first shared my top items to buy at Costco, I had vanilla extract listed at $6.99 for a 16 oz bottle. Just a couple of months ago I paid $16.99. Isn’t that crazy?! I was convinced to make my own homemade vanilla extract when I learned about the additives it can contain, but when the price nearly doubled, that sealed the deal. Alcohol: I prefer to use vodka (more on that below) and the cheapest I’ve found is $10.49 for 1.75L at Wine Depot, a.k.a. the “Costco of adult beverages.” I’ve also seen the same size bottle at Costco for $14.99. Vanilla Beans: My price point for vanilla beans is 75¢ per bean. Just a heads up, the vanilla beans at your local grocery store are grossly expensive. If you want to get the best vanilla bean without spending a lot of money, buy them online (these are the ones I buy and they’re less than my price point!). For comparison purposes, 25 vanilla beans is about 4 ounces. If we’re replicating a typical bottle of store-bought vanilla extract, you need about 16 oz of alcohol and 4 vanilla beans. Using the prices I can get locally, that makes each 16 oz batch of homemade vanilla extract just $5.84 – even cheaper than my previous best deal at Costco! The prices on vanilla beans have skyrocketed! If you click the link above to the vanilla beans that I buy, you’ll notice they are WAY above my price point. Yikes! Because of that, I’ve figured out a few vanilla substitutions that work for baking and cooking. In fact, I found 15 different ways to substitute for vanilla! You don’t want to skip the vanilla, but if the prices on beans right now will bust your budget, try a substitution. Substituting lesser priced ingredients for higher ones is the FIRST thing I teach my students in Grocery Budget Bootcamp. Because of substituting inexpensive ingredients, or ingredients already in the pantry, most of my students save money the first day of class! It always blows me away when I hear about the savings from simple substitutions. Homemade vanilla extract is just two ingredients: alcohol and vanilla beans. I’m a firm believer that quality ingredients just taste better. But in the case of homemade vanilla extract, go cheap – as cheap as you possibly can! The quality of alcohol doesn’t matter when you’re done making vanilla extract, so you can skip buying the good stuff. Your goal should be to find the best deal you can find for vodka, rum, brandy or bourbon and that’s it. Personally, I chose vodka because I use it in other recipes like homemade hand sanitizer and essential oil bug repellent. If you already have another suitable alcohol at home, I’d go with that. Of course, the flavor of the vanilla extract will taste different depending on the type of alcohol you use, so bear that in mind as you make homemade vanilla extract. It’s hard to say how much rum flavor will be present if you’re using just 1 tsp of spiced rum to make this extract, but if you’re not one to take chances, stick with vodka. This topic is debatable. If you are a vanilla extract connoisseur, then you’ll be able to tell the difference between a “rich and creamy” Madagascar vanilla versus a “mild, well-balanced” Bourbon vanilla and even the “floral, cherry-chocolate” Tahitian vanilla. Personally, I’ve never tried any other variety of vanilla extract than what my local store carries. I’ll likely never attend an official vanilla bean extract tasting, nor will I ever own multiple types of vanilla extract at the same time. If you’re a home chef like me and just want vanilla extract that tastes like vanilla, don’t worry so much about the type of vanilla bean. Just use vanilla beans that are fresh and offer the best bang for your buck. For me, that means using these vanilla beans. Because you have to store this stuff in something, right? Assuming you’re frugal like me, the best jars for homemade vanilla extract are the ones you already have on hand. Old oil and vinegar bottles are the perfect size. Once they’re washed, you can remove the label from the jar with this method and start making extract! If you don’t have any old bottles OR you’re giving these as gifts, there are plenty of super cute jar options available. Thrift stores and garage sales are good places to look, but this set of 8.5 oz swing-top jars is perfect for the job – it seals completely and keeps the vanilla beans submerged. Plus you can make a half batch of vanilla and it’ll fit perfectly. Depending on the article, some say to split the vanilla bean before submerging and others say to submerge the vanilla bean whole. It doesn’t seem to affect the final outcome, so I say do whatever is easier for you. Personally, the vanilla bean paste inside the pods are like gold to me, so I prefer to save the beans I have after using the vanilla bean paste in another recipe (like vanilla bean ice cream) and then use the pods to make extract. If you’re not making anything with vanilla bean paste anytime soon, go ahead and submerge the beans whole. When you run out of extract, or when the extract is ready, you can pull out a vanilla bean and use the paste within however you’d like. Another frugal perk of making your own homemade vanilla extract is that you can re-use the beans and make more! When you run out of extract, fill the container back up with more alcohol, set it aside and soon you’ll have another batch of homemade vanilla extract. The only catch with this is that your second batch might not be as flavorful as the original, but whether this happens depends on several factors (the beans themselves, temperature, bean to alcohol ratio, the alcohol itself, whether you’re used to cooking with watered down vanilla extract in the first place, etc.). My suggestion is to have two batches going at the same time so that you always have a “good” batch of vanilla going and that you’re able to use. Anytime you’re re-using the beans, taste the vanilla extract before you use it in a recipe to ensure it’s as strong as you’d like. If it’s not as strong, add new vanilla beans and let it cure. If the vanilla flavor is strong enough for you, consider that money saved! 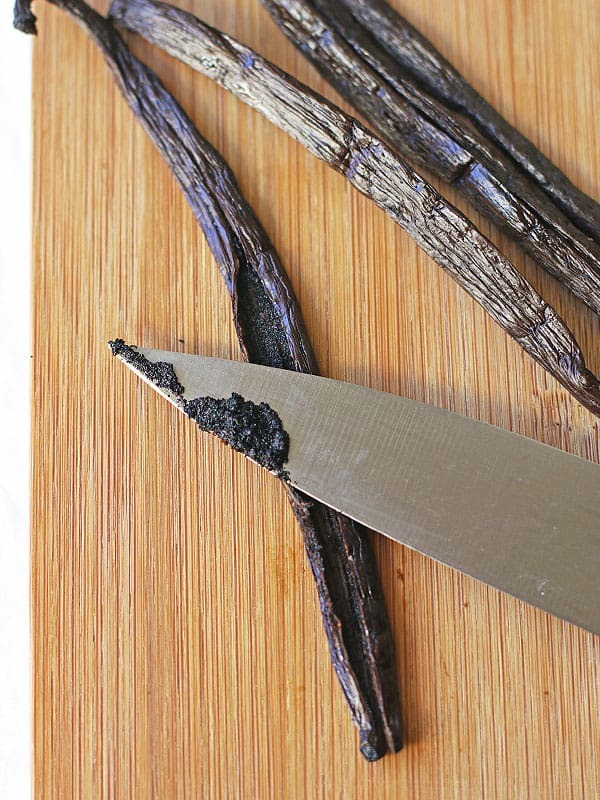 I haven’t tested this myself, but I’ve read that you can cut the vanilla beans in half, or even smaller, and that you’ll make extract in as little as 3 weeks. If you’ve done this before, would you let us know how it turned out? 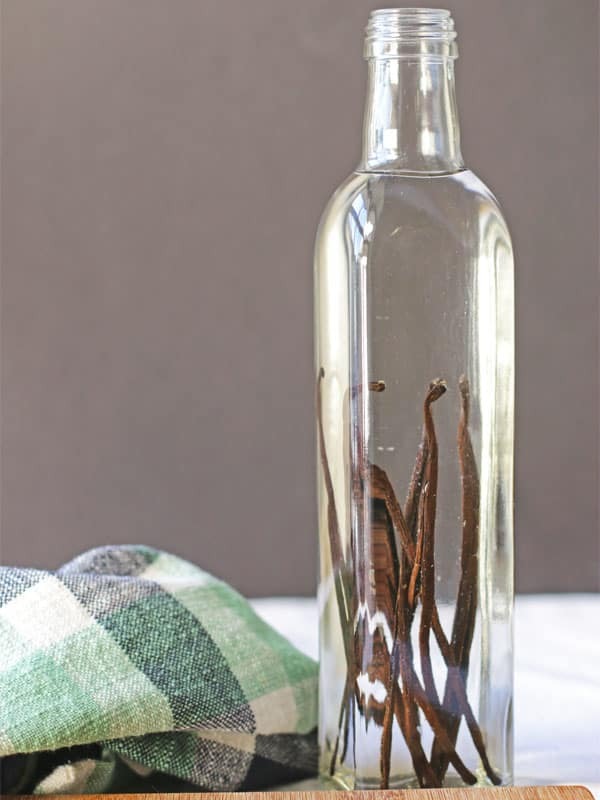 Combine alcohol and whole vanilla beans in a clean jar and seal. Place the jar in a cool, dark place for 2 months, occasionally agitating the beans in the alcohol. When the extract is done, you can leave the beans in or remove them. According to your legal definition, this recipe is not “pure vanilla extract.” 1 gallon = 8 pints. 1 gallon needs to have 13.35 oz of vanilla in it. That means to make a pint (16 oz) then you need 13.35/8 oz vanilla beans or 1.67 oz. Your beans weigh 4 oz for every 25 or 1 oz for 6.25 beans. Your recipe for a pint only uses 4 beans which is less than half the number (1.67 oz x 6.25 beans/oz = 10.4 beans) needed to legally make pure vanilla extract. It will still be vanilla-y though, but not very strong. I considered this Amy, but the FDA’s definitely also includes 65% water, where my homemade version does not. This (in my opinion) gives me leeway to use half the beans per definition, since the FDA allows dilution of OVER half the alcohol. Of course, you can use more beans if you want. I’ve made several batches of this and honestly, it’s more vanilla-y than any store-bought extract I’ve purchased! Tiffany, if you’re using 80-proof, your vodka is ALREADY 60% water. 151 rum would be right at 25% water, Everclear / Golden Grain is only 10%. I understand not wanting to dilute your end-product, but the definition essentially means you can’t use LESS that 70 proof vodka. I am only learning about the beans and how to use them – thanks for sharing your knowledge and experiences! I’m really glad I stumbled upon your post, as I’ve just started thinking about Christmas presents! Thanks for including the links to what you use, as it gives me a good starting point. You’re very welcome Amanda! I’m glad it’s helpful, and it’s truly a perfect time to get a jump start on gifts! I’m happy to see the recipe I was given by a friend isn’t that much different. I’m hoping to have some happy friends this Christmas holiday! This is amazing! For some reason I never thought about making my own vanilla extract, even though it’s very hard to impossible to get it in Europe (at least where I’ve lived). So helpful, as I’ve really missed this. The longer you let it sit, the better it will be. I never discard the beans, I may add them to a new bottle I am starting, along with a whole new batch of beans. Sometimes I think I have more beans than vodka in a bottle. Don’t forget you can also throw some of those used beans in sugar to use in cooking. For those of us who cannot use alcohol, this also works with glycerine : the taste is not as good, but still way better than buying ‘imitation vanilla’…! I tried to use the link to buy the vanilla beans, but that option not currently available. I was curious as to what a good price would be. I went to the same seller, and saw 5 beans for $23. When you add in the vodka, glass jar, and having to wait 2 months, the BJ’s store brand may be more cost effective. Of course, I would prefer homemade, but without knowing what a good price for the beans are, I may just stick with what I know to save the money. Georgia – the going rate (as of this comment) is $1.80 per vanilla bean. You’ll save a little bit on making your own versus buying in the first batch, but you really start saving in batch #2 forward because you can re-use the beans! I’m making 4 oz batches – would that translate to one bean per 4 oz bottle of vodka? Can’t wait to try this! Just wondering where you buy your vanilla beans now. I canNOT find any for under $2-$2.50 each minimum. TY! Hi MamaE! A vanilla bean shortage has caused the price of beans to skyrocket, so the average price right now is what you stated. With this in mind, the first batch of extract doesn’t save money. However, since you can reuse the beans, the second and third batches is where the savings come in. I followed this receipt and after 2 yrs it still just taste and smells like rum. Where I have gone wrong. I have four beans per 16 oz bottle. I just keep leaving them stored hoping it would get better. Only thing that has changed was the color looks like vinilla extract. Made them as Christmas presents. Still have six bottles. Is there any thing I can do to have this ready by Christmas. Maybe it was the beans Patrick? I know that my homemade vanilla tastes more like alcohol than store-bought does, but it does have a taste of vanilla. I’d taking the beans out, scraping the inner bean paste back into to the jar AND the vanilla beans. If you have extra vanilla beans, I’d add 1-2 per jar. Between these two things, you should have more vanilla-flavor soon! I just order from this company, They have great tracking and start at $2.50 a bean, they have different types at different prices. I look forward to making my first batch this year! Hi Tiffany! I have a question. I have vanilla beans from a previous batch that I split open before adding them to the vodka. Can I reuse these even though I didn’t keep the bean whole? I also have 6 more beans. I was thinking of using 2 new with the old in a 16 oz bottle. What do you think? Vanilla comes mostly from an orchid called vanilla planifolia (Mexico and Madagascar); and Vanilla tahitensis (used in French Polynesia). In the wild, and for the most part, they were only pollinated by one of tiny stingless bee of the Melipona genus. These orchids grow in hot, wet, tropical areas – 80-85F daytime, 65-75F at night; 85% humidity, in indirect light, under the shade of trees. Vanilla orchids can grow to be 100+’, but don’t bloom until they reach 20-30 feet in length. From a tiny seed, orchids can take 3-7 years to get large enough to flower – longer under adverse conditions. Once a plantation has plants, they are propagated via cuttings – it is faster than lab cultivated seed in flasks, but the time to maturity and flower is still long. Like most orchids, they don’t grown in the dirt, have air roots and in the wild grow on large trees. Plantations keep them looping up and down various tree fern structures so they are easier to pollinate and harvest. Vanilla Orchid flowers are hermaphroditic, meaning they contain both mail and female parts, cannot self pollinate and the pollen is highly inaccessible to other insects. Only a tiny stingless bee from the Melipona genus (mostly found in Mexico) has evolved to be able to get to the pollen – in the wild pollination only occurs 1% of the time. Thus, and this is the biggie – they have to be hand pollinated by humans. And hand pollinating vanilla orchids is a very tricky business – gosh if only one bee species in millions of years has been able to do it – you can imagine how difficult it is. It takes years for the plants to grow large enough to flower from a seed. Then once it begins to flower, each flower only lasts one day – sometimes just a few hours. The flower must be pollinated at just the right time after opening. Too early and the pollen isn’t mature enough, too late and the pollen has gotten too old and just won’t take. Many flowers are destroyed trying to perfect the technique. If pollination occurs, you still have 8-9 months to pod maturity. The pods are harvested by hand, and they don’t mature at the same time. Even once harvested – there is still a 3 month cure and ferment process to be able to use the beans. And finally, they can go to be turned into extract….a very lengthy and labor intensive process. You can now see why vanilla is just barely behind saffron as the 2nd most expensive spice in the world. THANK YOU for taking the time to share this information about why Vanilla is so expensive and how it is pollinated. I am making bottles of vanilla for my daughter-in-laws for Christmas and I will add this information on the instruction card I am including with their gift. Thank you, Tiffany for this great info! Wow, rosebudforglory, thank you so much for explaining about the orchids, vanilla beans and the bees! I have wanted to make my own vanilla extract because I have chemical sensitivities and many allergies. I have seen that the price has gone up on both the pure extract and the beans seem to be less available. I had wondered if it had anything to do with the hurricanes that had gone through last summer( I had planned to do some research on that about where the vanilla beans came from.) You have given much Insight into something that we just take for granted…… thinking that we can get endless supplies of vanilla beans or vanilla extract. Hi Ladies + Gents, Thanks to all of you for the very good info. Have been reading on the web “How to make homemade vanilla extract”. I’m gonna do it. I have just received my order of grade B Madagascan beans. I ordered by the lb. not by an X number of beans. Of course, being a newbie I’m easily confused. The area where I’m perplexed is the volume of beans to use. All liquid ozs. of Vodka are created the same. it don’t change. Web sites that I read are very confusing. Some sites say to use an X number of beans per vodka batch and some sites say to use an X number of ozs. of beans per vodka patch. All vanilla beans are not created equal and are the same size, weight, and volume. Which procedure should a person use? I believe the FDA recommends weights and fluid volumes. Thanks to all, long winded I know but trying to extract a good product. Hey Tommy! Homemade vanilla is super flexible, so I’d start with 5-6 beans and go from there. If you want a darker color in a couple weeks, add more! The beauty is you really can’t go wrong! Oils I use vanilla been past to make the extract? Do you mean paste? I’ve never heard of using paste to make extract, but you can substitute vanilla bean paste in any recipe calling for extract! Would anyone know if using a teaspoon of HOMEMADE Vanilla is more POTENT in a recipe than store bought vanilla extract? Just was wondering if you should use less of it in recipe? I don’t think homemade is more or less potent that store-bought. I use whatever the recipe calls for! Tiffany, on March 23, 2018, your reply to Tommy said to use 5-6 beans. Is that in 16 oz. of Vodka? Thanks. Pattie, yes I believe she was referring to 16 ounces. Have you used Bourbon for homemade vanilla? It seems to me, this would be a richer flavor. I haven’t simply because vodka is the cheapest, but you can use bourbon, rum, vodka, brandy… just about any liquor will do it! A neutral flavored alcohol will produce better vanilla extract if you are looking for vanilla flavor. Rum, bourbon, etc. may throw off the flavor somewhat. Some people may like that. Another suggestion, if available, use amber colored bottles. The reduce harmful light. I will use old root beer bottles. Hi Jeanne, how many beans do you use per ounce of alcohol? 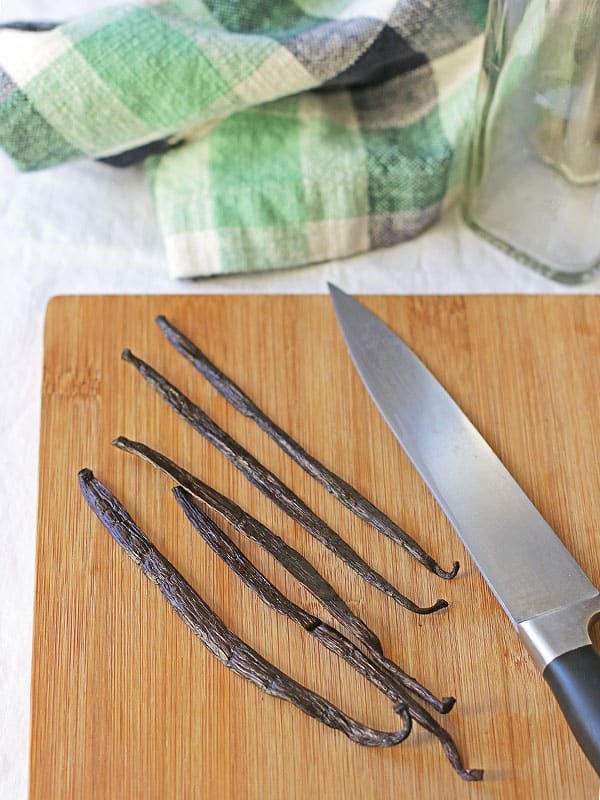 How do you compare the flavor of your homemade to your Mexican vanilla? Would it be possible to make extract using vanilla powder? I see recipes indicating 1/2 tsp powder is equivalent to 1 bean. I can’t find any reference to actually using the powder to make extract. Thoughts? My store-bought vanilla is opaque. The vanilla I’ve started soaking on January 23 is brown colored but not opaque. Will the finished product be strong enough if it doesn’t look like store-bought? Or is opacity not what determines quality? Good! I’m excited about making my own and saving money!